294 pages | 8 B/W Illus. The growing internationalization of markets, the relaxation of constraints on capital flows between countries, and the creation of different economic unions -- the European Union in particular -- initiated the flow of capital, goods, and services across national borders, growth and diffusion of shareholding, and increased merger activity among the world’s largest stock exchanges. These changes have stimulated an interest in understanding developments in accounting and corporate governance in a newly qualitative way. 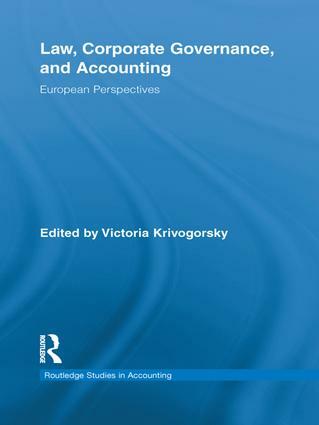 Law, Corporate Governance, and Accounting sets out a framework for the analysis of institutional environments as the interconnected key tools of modern public corporations. Along with examining latest developments in the integrated formal structures for the formulation of international accounting principles, analyzing new accounting regulations and the extrapolating on the lessons that can be learned from the harmonization of accounting principles in Europe, this monograph provides the analyses of the convergence in both auditing and corporate governance as well as US perspective on IFRS adoption. Dr. Victoria Krivogorsky is a faculty member in the Charles W. Lamden School of Accountancy at San Diego State University, USA. Her international experience includes serving on the faculty at ESSEC -Paris, France and ESCP-EAP European School of Management (Paris) as a visiting professor. Her research interests rest in the areas of international accounting and corporate governance, and her research efforts resulted in numerous academic publications. She presented the results of her research efforts at business schools in France, Netherlands, Switzerland, Portugal, Finland, Poland, Russia. She is a director of iBEACON (International Business Economics Accounting Collaborative Network).